Can't decide between the luxury of sailing in the Sea Pearl or the adventure of paddling one of our expedition kayaks? Why not do both? 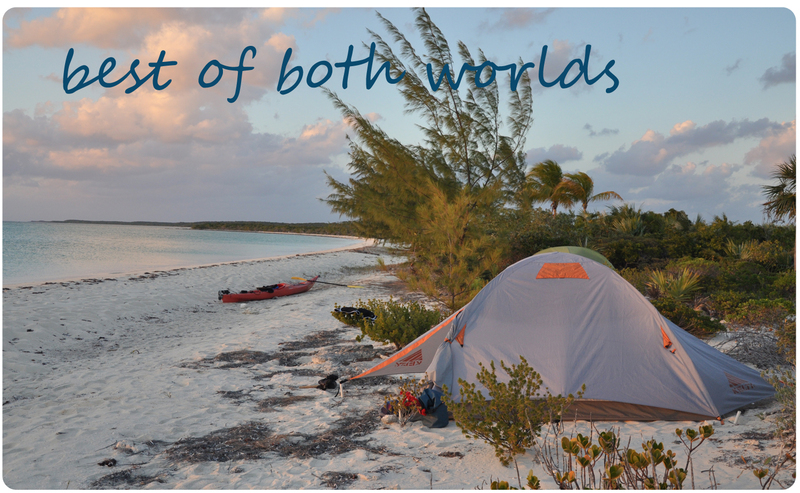 Best of Both Worlds gives you the opportunity to set sail in the cays and then explore them even closer by kayak. This trip gives you a taste of both so you can decide which one to do again later. Join us for a 6 days/5 nights (on the water) adventure which includes both kayaking and sailing! The price includes a meet and greet dinner the night before you set out and all meals & beverages while camping, boats, camping and snorkeling gear, support power boat and services of O.I.E. staff. As you make your way up the Cays, you will alternate between sailing and kayaking. Most days your guide will tow the kayaks as you sail to your next campsite in the morning. Afternoons will be spent exploring the surrounding areas by kayak to get an even closer look at the creatures and scenery that will take your breath away. For a detailed itinerary of this trip, please contact us. If you want to see how these sailboat are rigged and sailed, check out this little tutorial we've put together over on YouTube. Or to get an idea of the space you have for packing your gear in a kayak, we've put together this little video on how we like to pack a kayak.